Text messaging software is competent to send mass sms from GSM mobiles to all cellular phones via using Windows OS based PC/Laptops. End-to-end text messaging solution provides reliable way to deliver critical business and office records as well as personal info in easy way. Most economical marketing tool is used to send business promotional sms regarding new products, special offers, social gatherings, polls, reminders, stock updates, weather forecasts, invitations etc. Send group text messages from GSM based mobile phones. 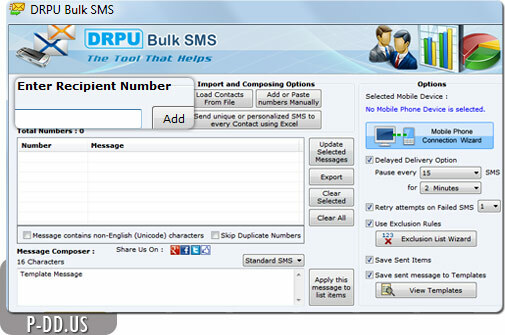 Simultaneously deliver group sms to any volume of users mobile phones. Facility to send Standard sms as well as Notification sms. Save sent message details with time and date at specified location on the system. Import phone number list from PC (saved in Text/Html file format). No internet gateway is required for sending text messages. Covers wide range of mobile network coverage area (national/international).